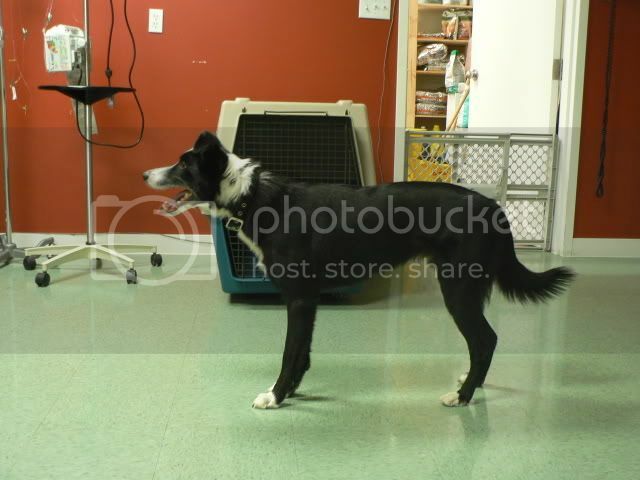 JENNSLK - Border Collie - TWISTER!!!!! It was too late to call you back last night and too early this morning so I thought I'd post his information. I spent lots of time with Twister yesterday and he is such a terrific dog. We tested him with an enormous (sweet) Rotti, Ben, and he passed with flying colors. He is a Border in the truest sense, focus and energy to burn. Does not appear to have any of the issue that were present with the creep who brought him in (wonder why ). He was playing with men and next to dogs and kept his focus and happy disposition....he would make someone a terrific agility partner. 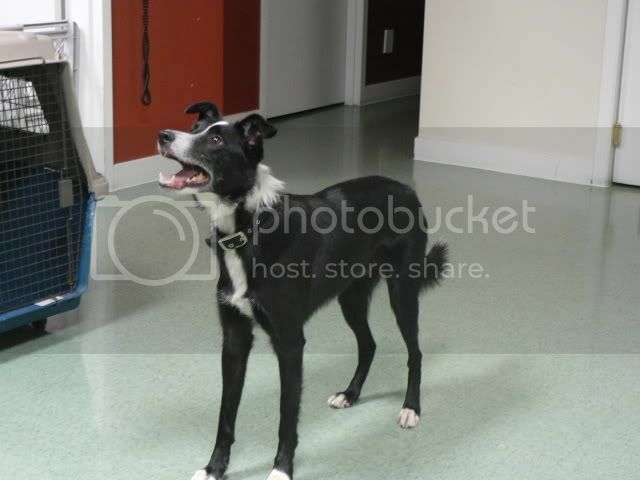 He is safe and getting loads of attention and remain with us until a loving forever home is found. Please pass his information around...he's a doll!!! Is he pure BC? Maybe I'm just stupid but it looks like there's something else in there.... His hair isn't that long and his legs look awfully skinny..
Yup, he's full Border.... There can be quite a coat difference. His stance is in typical Border anticipation. If you saw him move, you'd see only Border...I must say that I don't know who his breeders are as he is a rescue but I've seen many with this coat..
Is really is a cutie though!! Ah, well I guess you learn something new everyday! LOL, I thought the typical long haired coat was a breed trait. I was wrong obviously! He's cute!! I love that last pic. Gotta love those borders. 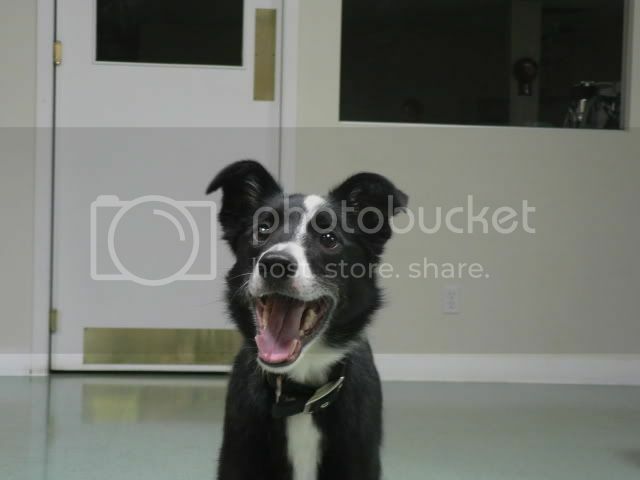 Border Collies can come in short coat. I prefer a longer coat. My border cross has a medium length (not short but not very long either) coat, but longer fur on her belly, tail, chest, and legs. If you get her wet she has little chicken legs. I find it hilarious. Oh, my... What a tease, Dr2. lol, I'm in the market for another BC. He looks like a lovely boy, how old is he? I hope he finds an excellent home soon. I just got home from meeting with Twisters new family. They take him home tomorrow. It's 2 gals who work for themselves out of their home. They live on a lake lot with lot's of ball throwing/frisbee tossing room. They have a little female border as well and the meeting between them couldn't have been more perfect. They make all of their little females meals fresh, they are in the fitness/nutrition business so they've really done their research into canine nutrition as well. 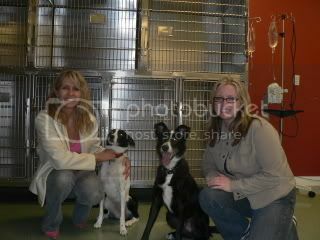 I'm so thrilled, this dog so deserved a wonderful home....he now has one. The 2 dogs looked like a happy couple....I'm going to sleep like a rock..Twister's going to be a very happy doggie! Don't they look great together! Oh, I'm so happy for him! I've met a few short-coated BC's before. I have to say that I like the medium coated ones better look-wise, but the shorts are much easier to take care of. I love the fluffy look to the longer coated BC's too. It was really cool that their Border female was also a short coat just like Twister seeing as they're not as common, and with the lake on their property I'm sure they're happy Twister will be and easy coat to clean and care for. There's a breeder in town here that specializes in the short coats, though she does have some longer ones. I keep meaning to look her up and go see her dogs sometime. Aww and here I was hoping to foster him. Im glad he has a home. Gonzo's Mom was a smoothie, and his Dad was a medium... so he's somewhere between medium and smooth. I would love a smooth-coated BC someday! LOL I know. I just want more dogs LOL. Here's an idea. I'll move in with you and that way I could have 7 dogs. LOL your 5 and my two.